Omega 3 Fish Oil is a perfect source of essential fatty acids for our dog's diet and one of the key ingredients in Dr. Dresslers Dog Cancer Diet. According to the Dog Cancer Survival Guide, Omega-3 fatty acids can help protect the body against cancer weight loss, it has been shown to help with depressions and shrink tumors within humans. High strength rapid release soft gel capsules. 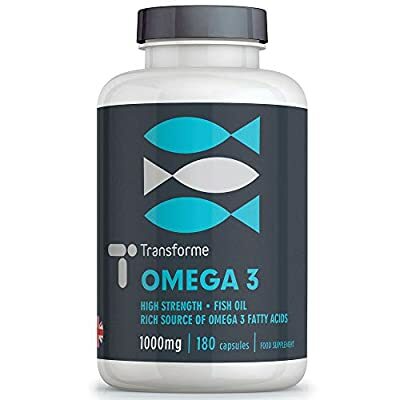 Transforme High Strength Omega 3 Fish Oil 1000mg is a highly concentrated and purified Omega-3 Fish Oil from deep sea, cold water fish. Providing a rich source of optimally-balanced EPA & DHA, essential fatty acids needed by the body and only available through dietary intake. PURE & POTENT - Formulated for superior absorption of Omega 3 EPA and DHA fatty acids by the body, molecularly distilled to remove contaminants and give purity. YOU CAN BUY WITH CONFIDENCE - Transforme has been supplying premium quality supplements for more than 20 years and we want you to be 100% happy with any purchase from us. So if you're not satisfied you get your money back, that's guaranteed. QUALITY COVERAGE - At Transforme we aim to provide you with high quality supplements to suit your needs at fair prices - we were among the very first to supply capsules in large 360 count pack sizes. Our recently upgraded 365-capsule bottle gives you up to a full year's supply, at one capsule per day. SEALED & DELIVERED -Transforme food supplements are delivered to your door or place of collection in a heat-sealed labelled bottle to protect the capsules or tablets. Take one to three softgel capsules daily, preferably with meals. Fish Oil, Vitamin E natural (d-alpha tocopherol). Capsule Shell - Gelatine (from beef), Glycerol, residual water.